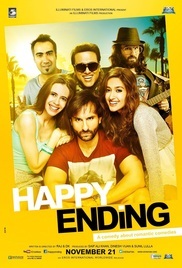 Plot: Happy Ending tells the story of a flamboyant author (Saif Ali Khan), who has hit a creative roadblock after his first novel became a success. He now has to find other ways to make a living. He also meets another writer (Ileana D'cruz), who does not believe in fame. Together, they set out to find out if their story has a happy ending after all.